Very often I feel inadequate. When I look at the jobs I have to do, they seem like huge mountains to scale and for my Everest assault I'm equipped with only a fork, a paper bag, some dental floss, and I'm wearing shorts, a tank top, and flip flops. Then I make the mistake of looking to my side. There are herds of other women, sure-footed as mountain goats, decked out in climbing gear from REI, managing to make it look as easy as a walk in the park as they nimbly navigate life's hazards, leaping from rock to rock, ascending at a dizzying pace. My biggest personal mountains are in the areas of my job (homemaking) and the raising, training, and teaching of my children. I meet amazing women, or read their blogs, and think, "My gosh, where does she find the extra 36 hours per day to be in a book club, do inventive crafts with her children, redecorate her bedroom, learn Italian, run marathons, publish a book, raise all their own food in the garden, play an instrument beautifully, can everything that grows, cook delightful, inventive, and healthful dinners every night, sew her own designer wardrobe, and still keep her home immaculately clean?" I compare myself to that and I just want to crawl onto the couch with a bowl of pudding, pull a blanket over my head, and give up. I'm not ever going to be that amazing, so why bother trying? I used to have hope that one day I'd be amazing, that one magical day it would all come together. My house would be spotless, my children would be on track in their schoolwork and would start reading the encyclopedia, just for fun. Since everything at home was under control, I could shed the stained sweat pants, put on a cute outfit, and go out with girlfriends, not dreading the inevitable phone call of "When are you coming home? They're trying to kill each other and if they don't succeed, I'll do it for them!!" But I've come to the conclusion that's not going to happen. I once had a friend (one of the amazing kind with perfect, mannered, homeschooled children and a spotless home) come over to my house for the first time. In shock she surveyed the debris of toys, socks, books, projects, shoes, dress-ups, and dog hair coating the living room and she said, "You must be really good in bed. My husband would never put up with this!" So I started a blog. A happy little corner of life where I could feel amazing. But I'll let you in on a secret. Just in case I might have you fooled, I'm still not amazing. Did you ever wonder why almost all of my pictures are close-ups of the food? Yes, partly it's to show the tantalizing texture of the food. But mainly it's because It's a chore to find more than 2 square feet of table or counter that's clear of stuff. I met Janelle at the food blogger's dinner I attended in the spring. We were each to bring something to share and she brought some red pepper jelly. Ohmygosh, it was love at first bite. Spread on a cracker with some chèvre, it was addictively good. 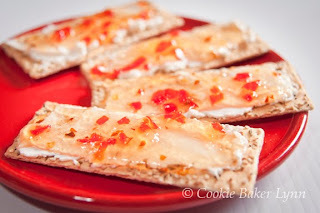 My husband, after his third cracker, said, "You have got to get this recipe!" Janelle, being an amazing person, already had it posted on her blog, making it super easy for me to copy her. And my family loves me for it. I didn't have any chèvre cheese, so I used cream cheese on flatbread crackers. Oh, heavens, it's good! Hot, sweet, salty, creamy, crunchy - it's a sensation overload for the mouth. You barely finish the first cracker before you're reaching for the next. 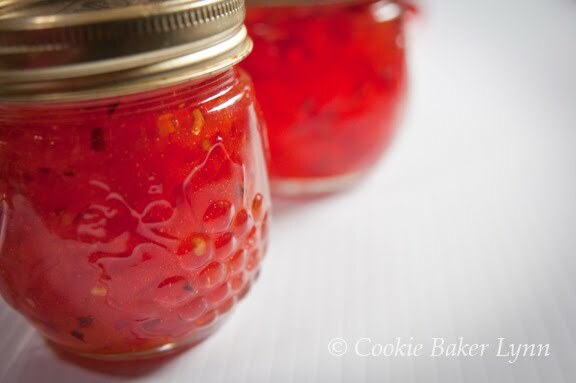 I put off making this jelly for months, thinking it would be really difficult and time consuming. It's not. It's super easy. In fact, next time I make it (which will be soon), I'm going to make up a big batch. I think jars of this will be my new favorite Christmas present to give! 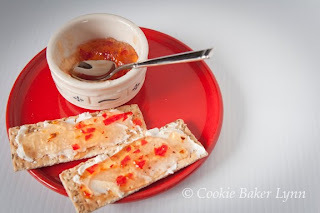 The next time you want to appear like you have it all together, use a snow shovel to get all the junk out of the living room, vacuum (vacuum tracks are important, they make it look like you clean regularly), and then serve this jelly with cream cheese on crackers. After the first bite, no one will care that you're only faking it. 1. Wash and rinse jars; let stand in hot water. Bring lids to boil; let stand in hot water. Read through the insert with the pectin, if you haven't used this brand before. 2. Either mince or puree peppers in a food processor. Place in medium saucepan with vinegar and red pepper flakes. Bring to boil, stirring occasionally, then let simmer 5 minutes. 3. Add calcium water to pan. Stir well. 4. In small bowl, combine pectin powder with 1/2 cup sugar (scoop the sugar out of the 2-1/3 cups sugar you already measured). 5. Bring pepper mixture back to a boil, stir in pectin-sugar blend to dissolve. Then add remaining sugar. Stir vigorously to dissolve, once it boils, remove from heat. 6. Fill jars to 1/4inch from top. Wipe rims clean. Screw on lids. Boil 10 minutes in hot water bath. Remove and let cool. Label. Hey, AMAZING WOMAN, thanks for the recipe! I always buy pepper jelly from the Jelly Girl at Pike's Place Market. As much as I love it, as much as I always look for it and never find it in the stores, it didn't occur to me to .....um....make it myself. Think I know what I want to do for Christmas presents! Thanks! I felt a twinge of sadness reading your post because I can relate on so many levels. Then I was like.....hey, wait a minute, I'm not alone! So yeah for not being alone!! Thanks for passing along the recipe, it looks wonderful. Fun running in to your cute hubby this morning! You are Fabulous! As a matter of fact I thought you were one of those women that I see when I glance sideways... Love your way of putting that all too familiar feeling. You ARE Miss Amazing, m'dear. Amazing is over-rated. After all, Martha Stewart ended up in jail, so being the perfect domestic goddess might not be such a good thing. So now that we understand each other please ignore the stack of newspapers waiting to be recycled, the shoes under the table, those stacks of catalogs with sticky notes, the unfolded laundry, the cat hair in the corners...need I continue? 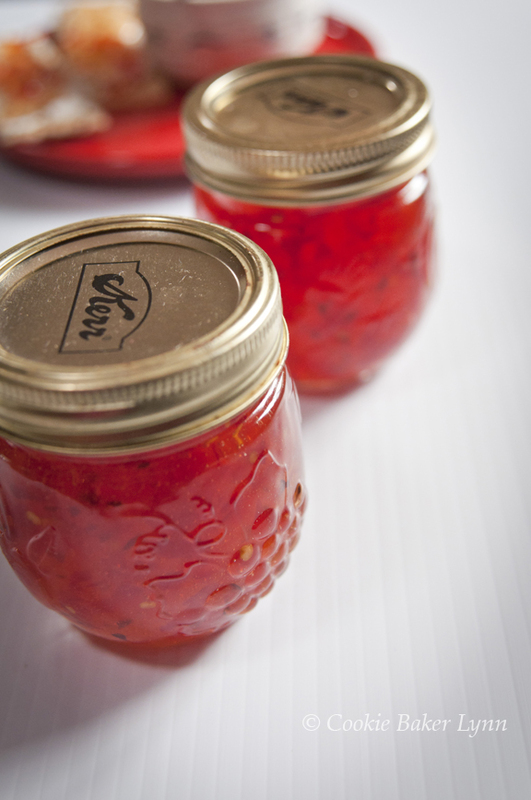 LOVE the pepper jelly and all your amazing recipes, copies or no. BTW that cooking camp you did...bet there were sideways looks toward you from moms who could never contemplate doing that...and enjoying it, too. Bravo Lynn! My FIL loves this kind of jelly, but I've never had any homemade! Is that woman still your friend?! "You must be really good in bed?" I don't LOL very often, but this post did it for me! I can totally relate, and thanks for the awesome recipe! You ARE amazing! Those women you think are amazing are not...there's always something. I learned years ago. I've always wanted to make pepper jelly...don't know why I haven't. Such a great gift too. OMG! I made this over the weekend and it is already a huge hit!!! Love it!